Effective identification of your facility is as important as marking the products you produce. Count on Coridian to assist you in making your facility safe and efficient as possible. Labels and tapes provide a quick solution for a variety of equipment and facility identification. 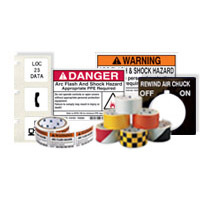 Our labels cover a wide range of applications including: barcodes and tracking, chemical and hazard communication, electrical awareness, facility and equipment, environmental indicating, lab management, and product ID. Our tapes are also a good solution for: barricades, floor and traffic control and facility ID. 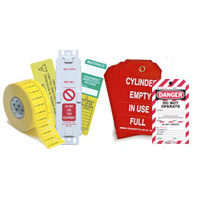 Our labels and tapes will effectively communicate important safety messages, identify critical components or equipment or organize any product or area in your facility. Pipe markers and valve supplies, tools and identification products let workers trace process problems and find solutions faster. Our pipe and valve marking solutions help satisfy safety and ASME (ANSI) standards and are available in a wide range of materials that meet your need for indoor, outdoor, harsh environment or light duty applications. Our industrial tags are made of high performance, durable materials that can withstand harsh environments - both indoors and outdoors. They can be used for hazard warnings, valve identification, equipment instructions, accident prevention and more. 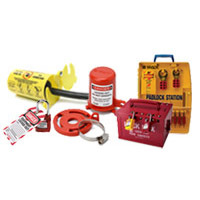 The world leader in lockout/tagout products and services, Brady offers a broad range of durable, easy-to-use lockout devices that cover most mechanical and electrical applications. In addition, Brady covers other critical aspects of a compliant, effective energy control program by providing innovative solutions for training employees, creating documented procedures, and identifying energy sources. Brady's services help companies with limited resources quickly get their program up to speed, ensuring that lockout activities are implemented in a way that promotes optimum safety while maximizing efficiency and reducing downtime.